Did the ICC help Uhuru Kenyatta win Kenyan election? Uhuru Kenyatta has been elected Kenya's president despite facing trial at the International Criminal Court, where he is accused of crimes against humanity following the previous election. The BBC's Anna Holligan in The Hague asks whether the indictment actually helped his campaign, and how can he govern a country while defending himself in court? As a scarlet landscape of Jubilee Coalition supporters prepared to congratulate the new president, one small but audible group was chanting not Uhuru Kenyatta's name but that of the former International Criminal Court chief prosecutor Luis Moreno-Ocampo. "Look at this, Ocampo," they gestured towards the undulating expanse of red, urging the man who brought the original charges against six high-profile Kenyans to recognize a scene that represented the autonomous desire of the Kenyan electorate to put Mr Kenyatta in the president's office rather than a dock in The Hague. 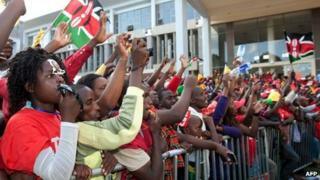 Initially many commentators predicted that the charges would hinder Mr Kenyatta's presidential ambitions. His rival, Prime Minister Raila Odinga, questioned the ability of his rival to run Kenya "via Skype from The Hague". But anecdotal evidence suggests Mr Kenyatta re-branded the indictment in such a supremely intuitive way that the ICC label actually worked in his favour. He denies the charges. In a country torn apart by ethnic divisions in 2007, there was great pressure to maintain an inner calm. But it was perfectly acceptable to adopt a powerful stance against the enemy overseas. The Kenyan elections, to some extent, turned - by accident or by virtue of clever political manoeuvring - into a referendum on the ICC and in turn the West "meddling" in Kenyan affairs. It was a Kenyan lawyer that referred this case to The Hague and the ICC's top prosecutor is now a highly acclaimed Gambian lawyer. "It really does look like an African court. It would be good PR to hold these trials in situ and perfectly possible to move them to Arusha [where a UN court was established to try Rwandan genocide suspects] and it would do wonders for the reputation of the court in Africa," he said. And regarding the trial "via Skype"? "To hold a trial via video link, with Mr Kenyatta sitting is his suit and tie in the president's office? Well, that would look ridiculous and would just undermine the power of the court," Mr Jacobs said. Investigations are being conducted elsewhere, but to date, the only suspects indicted by the court are Africans. Mr Ocampo's successor as chief prosecutor, Fatou Bensouda, however is always quick to point out: "It is the victims we are representing, so in these cases we are representing African victims." Will Mr Kenyatta winning the presidency affect the trial? Ask the ICC and the answer is an unequivocal: "Absolutely not." "The two things are totally separate," explains ICC spokesman Fadi el-Abdallah. "What is for the Kenyan people is for Kenyan people to decide, we respect their decision, but it has no influence on the proceedings before the ICC, because it is a purely judicial matter that is separate from the political considerations." Article 27 of the Rome Statute, upon which the ICC is founded and which Kenya ratified in 2005, explicitly refers to the "irrelevance of official capacity" in judging criminal responsibility or the court's right to exercise jurisdiction over a person, regardless of their position. Sudan's President Omar al-Bashir is wanted by the ICC but currently running his country from the presidential palace in Khartoum. While Mr Bashir refuses to co-operate with the court, and is consequently pursued by human rights activists seeking his arrest when he travels abroad, Mr Kenyatta has so far exhibited a complete willingness to co-operate with proceedings in The Hague. But some predict the Kenyan trial could get complicated. "My guess is that Kenyatta will find a way to extradite himself from his pledge," writes US law professor David Bosco. "Kenyatta will no doubt face some pressure from Western states… but he will likely calculate that, given their other interests in Kenya, they won't force the issue." Indeed, the United States has invested heavily both militarily and financially in this important African ally. Kenya is helping to track down the al-Qaeda-linked militant group al-Shabab in Somalia. Defence lawyer Mr Jacobs believes the trials will proceed, but slowly: "I think it will be a year or so, easily, the prosecution have been violating the rights of the defence by leaving it to the last minute to disclose evidence and now one of their key witnesses has disappeared. "All of this is working in Mr Kenyatta's favour. It's totally unrelated to the elections, just very unfortunate timing." What happens with the Kenya case could be a defining moment for the ICC. "Western states have responded to the election by congratulating the Kenyan people but not Kenyatta himself. Some states, including the US, have said there will be consequences," notes Mark Kersten, an expert in transitional justice at the London School of Economics. "These states, including institutions like the United Nations, will now have to measure their response and relationship with Kenyatta with the reality that Kenya is a key regional ally and economic power. "How all of these dynamics shake out will ultimately determine whether the ICC's legitimacy and influence is bolstered or undermined by the election." In his victory address, Mr Kenyatta promised to respect his obligations to the international institutions while simultaneously advising foreigners to "respect the sovereignty and democratic will" of the Kenyan people. For the Kenyan families, hundreds of them, who still don't know who was responsible for the deaths of the people most important to them, it may be hard to dismiss the relevance of the ICC. Mr Kenyatta is due back in court in July.